This scene shows the temple gardens of Eitaiji in the Fukugawa district of Edo, at the Tomioka Hachiman Shrine. This shrine constituted the largest and most popular religious complex east of the Sumida River. The Eitaiji garden was open for only a short period each year. The small hill with the zigzag path is a mini-Fuji, constructed here by members of the Fujiko in 1820. The simultaneous blooming of pink cherries and red azaleas shown here may well be an instance of artistic license. 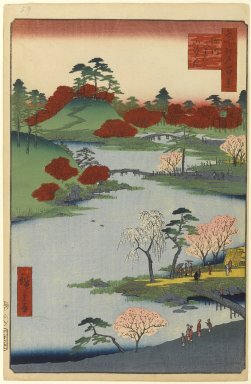 One might also ask why this print is included in the "Summer" group, since cherry trees bloom in the Spring. Eitaiji was abolished in 1871 with the forced segregation of Shinto and Buddhism; much of the garden was finally turned into a playing field after World War II and the mini-Fuji was made into a parking lot in 1965.